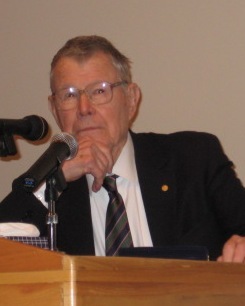 The 2005 Nobel Prize in economic sciences was awarded to Thomas C. Schelling and Robert J. Aumann, ”for having enhanced our understanding of conflict and cooperation through game-theory analysis.” Schelling was a pioneer in behavioral economics, accomplishing significant and influential work in the ideas of coordination, commitment (both promises and threats), deterrence, focal points, and segregation. Schelling’s early work was on the most important issue of the Cold War: preventing it from becoming a hot war. In his classic 1960 book, The Strategy of Conflict, Schelling laid out some important applications of game theory to the issue of nuclear war. In one passage, he discussed the U.S.-Soviet conflict in the terms of a hypothetical duel. He wrote “if both [duelists] were assured of living long enough to shoot back with unimpaired aim, there would be no advantage in jumping the gun and little reason to fear that the other would try it.” Thus “schemes to avert surprise attack have as their most immediate objective the safety of weapons rather than the safety of people.” This means that to have a credible deterrent against a Soviet first strike that would destroy many of its people, the U.S. government needed to defend its weapons first, rather than its citizens first. While the government may appear to be placing the value of its weapons above the lives of its citizens, the threat of deterrence is not credible if the weapons are exposed. Schelling developed another important concept in game theory: the significance of pre-commitment in interactions. An actor can be made better off if his choices are limited in advance. For example, a firm may invest in now-unneeded capacity to deter competitors from entering a market. Or a general may destroy a retreat route to signal to the enemy, and his troops, that he is committed to the coming battle. A bus driver who cannot physically open the fare box is safer than one who can. Schelling studied the ability of actors to coordinate their behavior even when not able to communicate. He observed that coordinative solutions in games were arrived at more often than theory would predict. These “focal points” (sometimes called “Schelling points”) were reached frequently due to the actors’ shared frames of reference, Schiller reasoned, such as social conventions and norms. One such game consists of two people being asked each to select a positive integer. If both choose the same number, they both receive a reward. While there are infinite options, both people typically choose the number 1, since it is the smallest positive integer. Similarly, when a person is told that he must meet someone else in New York City at an unspecified place and time, many say — independently — that they would try under the clock in Grand Central Terminal at noon. The focal points just described represent beneficial coordination from actors who are unable to communicate. Automotive traffic can be considered an example of a lack of coordination from actors unable to communicate. For instance, congestion might occur in the inbound lane, even though an accident occurred in the outbound lane. If each driver inbound slows down by only three seconds to look, and if there are 300 slowing drivers, the result is a 15-minute delay. Schelling explained that even though each person knows this, the problem still exists. When a person has paid her 15 minutes, she wants the “reward” of seeing what happened. Schelling noted that many problems such as traffic congestion occur because it is too difficult to enter an exchange. In Micromotives and Macrobehavior he wrote, “Small children learn to trade stamps with an acumen that the real estate fraternity can only envy, but their parents can travel incommunicado behind a slow truck on a mountain grade without finding a way to make it worth the truck driver’s time to pull off the road for 15 seconds.” He also showed that an integrated neighborhood can become quite segregated as long as each person wants at least one third of the neighbors to be like him. When one person moves to get a preferred set of neighbors, it causes a chain reaction that settles down only when the neighborhood is fairly segregated. In his 1991 presidential address to the American Economics Association,2 Schelling pointed out that the expected effects of global warming on developed countries would hardly be noticeable and might be good: He noted as evidence that when people retire, they typically move to warmer climates. Although the effects on poor countries would be more serious, he argued that compensating them would be cheaper than investing the then-$200 billion a year ($350 billion in 2016 dollars) to slow global warming. The most spectacular event of the past half century is one that did not occur. We have enjoyed sixty years without nuclear weapons exploded in anger. There has never been any doubt about the military effectiveness of nuclear weapons or their potential for terror. A large part of the credit for their not having been used must be due to the “taboo” that Secretary of State Dulles perceived to have attached itself to these weapons as early as 1953, a taboo that the Secretary deplored. Schelling earned his A.B. in economics from the University of California, Berkeley in 1944, and his Ph.D. from Harvard University in 1951. He worked for the Marshall Plan in Europe and the RAND Corporation. He has taught at Yale, Harvard, and the University of Maryland. He has been elected to the National Academy of Sciences, the Institute of Medicine, and the American Academy of Arts and Sciences. He was an adviser to movie director Stanley Kubrick for the classic 1964 movie Dr. Strangelove: or How I Learned to Stop Worrying and Love the Bomb. 1960. The Strategy of Conflict. Cambridge: Harvard University Press. 1966. Arms and Influence.New Haven: Yale University Press. 1977. Micromotives and Macrobehavior. New York: Norton. 1984. Choice and Consequence: Perspectives of an Errant Economist. Cambridge: Harvard University Press. Zeckhauser, Richard, “Distinguished Fellow: Reflections on Thomas Schelling,” Journal of Economic Perspectives, Vol. 3, No. 2, (Spring 1989), pp. 153-164. A shortened version of that address is in Schelling, Thomas C., “Greenhouse Effect,” in David R. Henderson, ed. The Concise Encyclopedia of Economics, 1st ed. at http://www.econlib.org/library/Enc1/GreenhouseEffect.html. Schelling, Thomas C., “Self-Command in Practice, in Policy, and in a Theory of Rational Choice,” American Economic Review, Vol. 74, No. 2 (May 1984), pp. 1-11. Ellsberg, Daniel, Secrets: A Memoir of Vietnam and the Pentagon Papers, New York: Viking Penguin, 2002, p. 348.